We are pleased to announce the online publication of Volume 13 of the Springer Book Series “Translational Systems Sciences” by a team of authors of the BCSSS Research Group Systems Science and Philosophy. Update September 2018: with now more than 600 downloads! 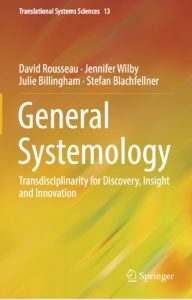 Under the title “General Systemology – Transdisciplinarity for Discovery, Insight and Innovation” David Rousseau, Jennifer Wilby, Julie Billingham and Stefan Blachfellner expand the foundations of general systems theory to enable progress beyond the rich heuristic practices available today. The book establishes a foundational framework for the development of scientific transdisciplinary systems principles and shows how these can amplify the potential of individuals and teams working in multi-, inter- and transdisciplinary contexts or striving to translate their progress across disciplinary boundaries. We are very glad about the online release and looking forward to the publication of the print version right on time for the 62nd Annual Meeting of the International Society for the Systems Sciences ISSS2018. Especially David Rousseau, current ISSS President and BCSSS Scientific Council member, is proud to present the new book during this year’s conference. Additionally we take particular pleasure in the foreword by the Editor-in-chief of the Translational Systems Sciences series Prof. Dr. Kyoichi Jim Kijima, Emeritus at the Tokyo Institute of Technology, President of the International Society for the Systems Sciences 2006 and President of the Japan Society for Management Information since 2015. ‹ UES2018 Brussels – Dead Line Extension for Individual Contributions: May 31th 2018!